Today is Tuesday, November 22, the 327th day of 2016, with 39 days remaining. There are two days until Thanksgiving, 29 days until the winter solstice, 32 days until Festivus, 33 days until the start of Hanukkah, 34 days until Christmas Day, 60 days until Donald Trump becomes president of the United States, and 716 days until the November, 2018 mid-term election. 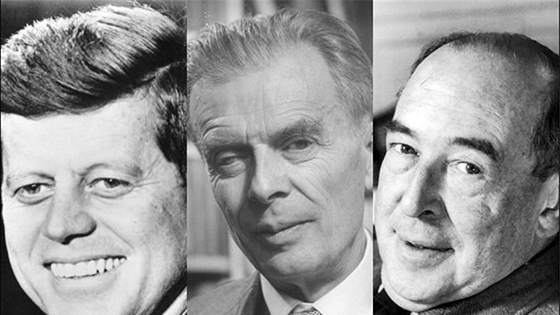 On this date in 1963, the assassination of U.S. President John F. Kennedy dominated the news, causing most people to be unaware of two other deaths that day- of philosopher Aldous Huxley, author of Brave New World, and Christian scholar C.S. Lewis, author of The Chronicles of Narnia series. "Huxley and Lewis looked beneath and beyond our known world, respectively: Huxley into realms of deep transcendentalism, Lewis into the Christian eternal. Yet Brave New World engages brilliantly with the real world of human social systems, and stands as one of the defining visions of the human future- indeed, in our consumer-driven post-Soviet world it has arguably proven more accurate a forecast than with George Orwell's 1984. Lewis' influence might be felt most deeply among admirers of his Christian apologetics, but his widest influence is sure in his Narnia books: common ground as childhood reading, helping literally to build the imaginations of vast numbers of us. Kennedy's clearest legacy is twofold. He propelled humans on their furthest exploration by launching NASA's moon missions, which quite inadvertently revealed to us- in the photographs taken from the moon- the fragility and preciousness of our own blue-green world. And during the Cuban missile crisis of 1962 he kept this world from the brink of nuclear destruction." Among other things, today is also National Absurdity Day, which recognizes either the conflict between (1) the human tendency to seek inherent value and meaning in life and (2) the human inability to find any, or the quality or state of being absurd, a thing that is extremely unreasonable, so as to be foolish or not taken seriously, or the state of being so. While the official day is today, the United States has apparently converted its observance into an ongoing event, which began this year on November 8. Florida man enters record book with world's largest dinosaur feces collection. As of this writing, The KGB Quotations Database contains 42,151 entries. Check it out. "History is not a web woven with innocent hands. Among all the causes which degrade and demoralize men, power is the most constant and most active." Today's edition is late and abbreviated due to some ongoing production issues. Turns out the problem's not software, it's hardware, and an insidious one which requires me to tear apart and check all the networking and power cables. I suspect there's a cat involved. Anyway, I'm biting the bullet and completely rearranging and rewiring my office. I'm putting all the wall warts on switchable outlets, which should help me save a kilowatt or five on the monthly power bill.